I picked this up as it’s on the 2019 Carnegie Longlist. It features aliens and mysterious events so isn’t typically the kind of book I’d go for. Jazmine is trying to come to terms with the disappearance of her best friend, Becky. There’s no trace of her, but we learn she jumped off a tower and disappeared. We dip into the past and present to try to learn the circumstances of what’s going on. We’re introduced to the friends, learn about their relationships and their keen interest in two other characters who seemingly disappeared after jumping from a tower. This is not a particularly taxing read, and the story is not necessarily credible. 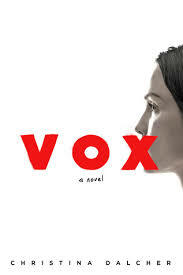 However, it explores some interesting questions about humanity and what makes us as we are. I’ll be interested to see if this makes the shortlisted titles. 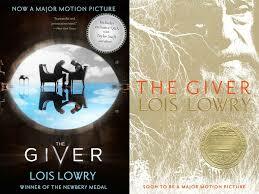 For many this is regarded as the original YA dystopian novel. It’s cropped up on my recommendations time and time again, but I had never heard much about it. In this world, everything is strictly regulated. It’s all done for people’s safety and well-being, but it’s so safe and constricted. Nobody knows this, because they’re indoctrinated into the lifestyle. From early on they’re trained to be precise in their language use (abstract nouns such as love don’t have any place here); they’re unfailingly polite; they don’t ask questions and every detail of their life is regulated. This way, people can’t make wrong choices. They can’t be upset. They are also, it seems, not really living. Jonas is almost twelve when we meet him, and he’s eagerly awaiting the details of his work training. On the day of the ceremony he’s left out. However, this is because those in charge have decreed he should become a Receiver. This is the highest honour that can be bestowed in the community, but nobody really knows what it entails. When Jonas starts his training it is with a mix of eagerness and worry. He is told his new job will be to receive the memories – not just of the community, but of those that came before, and those from even earlier. He will be granted access to books, and he will – eventually – be able to see the world in colour rather than the black and white sameness that everyone else experiences. Initially, the training focuses on pleasurable experiences. He is shown the exhilarating memory of sledging down a hill, feeling the sun on his skin and happiness at a birthday party. Soon, however, he is also given less pleasant memories. He sees war, he feels the pain of a broken limb and the loss of death.Jonas can talk to no one about his training, only the person giving him the memories (the man he will replace). In their conversations we are encouraged to consider for ourselves our own thoughts on these topics. The ending was a curious one. I know this is part of a quartet, though it seems each story focuses on a different character. It’s hard to work out what we’re meant to feel at the end of this. While it was hopeful, there was also a melancholy to it that unsettled me. The first thing to say about this book is that it’s very different to anything I’ve read before. Puzzling, but breath-taking in its approach, I have to admit that for a substantial part of the reading I was wondering quite how these characters/their stories linked. 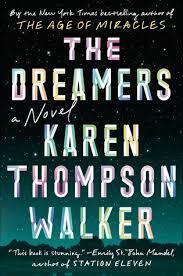 The second thing to say is that this was a book that made me feel I was constantly reaching for something, only to have it tugged away at the last moment. It was elusive, but not in a frustrating way. Having just finished it I’m aware of feeling unsettled, as if I need to read it again to get a firmer grasp on its message. 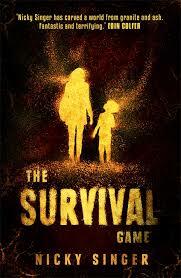 Station Eleven is the title given to a comic book series that features at moments throughout the book. It’s a work of love by Miranda, a character within the story, that explores the idea of a hidden civilisation. Very often when reviewing a book I focus on the general plot and give my reactions to it. 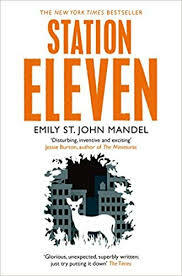 Station Eleven felt, for a lot of the time, like a book with no story – more an exploration of the timeless ideas of what makes us who we are/what it means to be civilised. So, why does it feel like a book that’s so important? The book opens with famous actor Arthur Leander dying on stage as he performs Lear. It’s a moment that foreshadows the events to come. For, at the same time as trainee paramedic Jeevan is trying to resuscitate Arthur, a deadly virus is spreading the world. Within hours of coming into contact with this virus, people come down with flu-like symptoms. Within hours they are dead. Civilisation as we know it is coming to an end. The timeline skips and, at times, I found this disconcerting. We flit between the time Arthur is dying and the immediate aftermath to twenty years after the end of the world. We also venture into the past to learn more about the five characters central to the story. They are connected in ways that seems most unlikely, but reinforces the sense of humanity. My somewhat random thoughts here do, I think, reflect what a strange read this was. That’s a good thing, but not one that immediately feels comfortable. Our story begins with young student Mei, an outsider in her dormitory, hearing her roommate drunkenly come home. She goes to classes and when she returns later the next day realises that her roommate is still asleep. Nobody knows why, and there isn’t anything the medical staff looking after her can do, but slowly the town succumbs to this bizarre situation. One by one people drift off. They sleep, their heart slows and there are signs of them dreaming. There’s no explanation for this scenario, and nobody comes up with any answers about how to deal with it. All too soon the town of Santa Lorna is placed in quarantine. Nobody can enter, and nobody can leave. Everyone is treated with suspicion, as nobody can tell who might have the virus. We follow a number of characters through their experience. Initially I felt the writing was atmospheric and there was a stifling feel to what was described. Sadly, the scenario doesn’t lend itself to a sustainable one for me. There’s a limit to how many people can fall asleep and how many dreams can be described before I lose interest. This was a beautiful opening that promised much, but felt like it fizzled out. With no explanations offered for what took place and no real advancement in many of the characters I had a rather detached reaction to the closing section. Shame. Emma is reluctant to return to Darkwood Academy as her best friend, Oliver, recently died. Emma feels his loss acutely – and this is made worse when it’s announced that six clones will get a place at school. One of the clones is of her dead best friend. The first part of the book focuses on setting up the group and trying to establish the idea that there’s something weird about this set-up. We spend a fair bit of time learning about the world of Darkwood and the group known as the Ten. 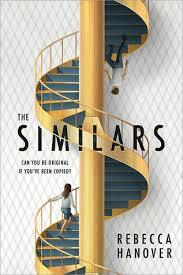 Then Emma’s roommate is attacked and she has to work with the Similars to work out what’s going on. As the story progresses it’s increasingly obvious that those in power know more about the situation than they’re letting on. The ‘evil genius’ behind the scheme has spent a long time planning this, but it’s never going to work when the kids are rather adept at finding out stuff they’re not meant to know. Emma is a pretty determined character, though some of the scenarios she ends up in don’t really work. The developing relationship between Emma and Levi was intriguing, but the revelations at the end certainly hint at something exciting to come and go some way to explaining the responses Emma has. 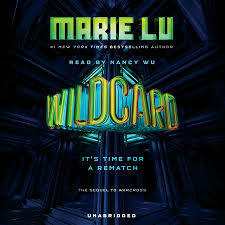 Second in the Warcross series this returns to some familiar themes while developing the story in a quite intriguing way. Emika is not in a great place following the Warcross Championships. She feels she’s messed up some of the things that were good for her, but she is determined to do what she can to put things right. Appalled by Hideo’s plans for his Neurolink, Emika finds herself caught up in a dangerous game to try to put things right. 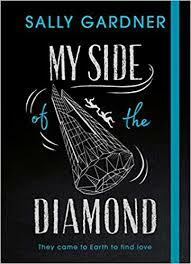 Though she takes huge risks to do this, it’s not always clear who’s acting out of the best of intentions and this makes for a tense and exciting read. There’s a bit more focus on the technical stuff here, and we get some answers to the parts of book one that didn’t quite make sense. Emika surprised me with how far she was prepared to take things, but it built up to a cracking finale. I couldn’t help but feel that the ending was slightly murky. Definitely shades of grey here, which makes me wonder if we’ll get more to this. I do hope so! Bestselling author Lauren Oliver digs deep into questions of how to be a human being in a world where humanity cannot be taken for granted. In Ringer we catch up with Lyra after she has escaped from the Haven. She and Caelum are on the run, trying to work out who can help them. Again, we have the flip book format. You can read alternate chapters or the stories in turn. 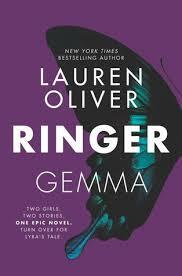 For this one I read Lyra’s story before Gemma’s and, having got to the end of the story, I confess to feeling rather perplexed. I loved the idea behind this story, and it was good to see a little more into the minds of those who have created the replicas. It posed interesting questions about mankind and what it means to be human. While the idea is exciting, there were sections where I found my attention wandering. Splitting the focus between the characters meant I never felt fully engaged by either. Having a superpower must have been high on everyone’s wish-list as a kid. But what do you do if you actually have a superpower…and don’t really know how to control it? 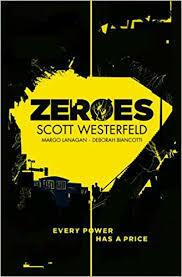 In Zeroes – the first in a new trilogy – we meet a group of teens who each have their own power. They’re not always in control of their power, and the after effects of them using their power can be catastrophic. We open meeting Ethan, Scam, a boy who has two voices; one of which always knows just what to say. Unfortunately this voice doesn’t always think about the consequences that come into play. When he is caught up in a bank robbery and becomes an internet sensation, he has little choice but to contact the friends he hasn’t really seen for the last year. The Zeroes. There’s nothing particularly new here, but this story of a group learning to use their powers is a thrilling story. It introduces us to a very varied cast and makes us intrigued by all of them, which is no mean feat. Of course, you’ll have a favourite but it’s fascinating to watch them go about their business. There’s also some explosive action, some serious villains and a real need to see what happens next.